India’s new Prime Minister Narendra Modi has inherited the ongoing problem of supplying energy to one of the world’s largest economies. The challenge is made even bigger by India’s ambitions to meet rigorous renewable energy and carbon reduction targets. But coal — particularly from Australia — will remain a temptation. Modi, as state leader for Gujarat, made his name in renewable energy by overseeing India’s largest solar program. But he may face greater difficulties on a national scale. The electricity sector in India is the fourth largest in the world, and yet 300 million Indians remain unconnected to the electricity grid. Meanwhile, India aims to reduce carbon emissions by 20 to 25 per cent of 2005 intensity by 2020. India’s renewable energy ambitions are driven both by the need to reduce carbon emissions and by falling renewable energy prices (relative to increasing coal prices). The Renewable Mix Target sets a target of 15 per cent of India’s total electricity generation by 2020. This target ignores large-scale hydroelectricity, but with renewable energy generation currently at 12 per cent India is in a good starting position. The Renewable Capacity Target is a target for installed capacity. Set in 2012, it aims for 41.3 gigawatts of installed renewable capacity by 2017, increasing to 72.4 gigawatts by 2022. As of March 31 India has 29.5 gigawatts installed capacity. The capacity target also sets ambitions for individual technologies 4 to 20 gigawatts of solar capacity, and 20.2 gigawatts to 27.3 gigawatts of wind energy by 2017 and 2022. Solar and wind currently stand at 2.2 and 20.2 gigawatts respectively. The portfolio standard is a cap-and-trade scheme, due to end in 2015. Current estimates suggest the scheme has had the desired effect, and rules for continuing the scheme are being considered. Finally, the solar mission is a solar-specific program to increase grid-based generation to 20 gigawatts by 2020, funded by a national feed-in tariff. More than 80 solar manufacturers are now establishing in India in anticipation for the roll out. But the problem remains of India’s energy deficit — demand exceeds supply by 10 per cent. Increasing renewable energy will also add to the problem of supply. India’s electricity network is not built to deal with more intermittent, renewable generation. Currently up to 32 per cent of electricity is lost in transmission and distribution — upgrading the network alone could help bring the supply-demand equation back in to balance. India’s electricity sector will continue to grow — but it may not meet the ambitious targets set. Research shows that the variability of wind is greater than most regions, and changes significantly with the seasons. Solar energy for large-scale solar projects is also only available in less than 10 per cent of the country. While there is no doubt that renewable energy will grow, growth in demand will mean coal remains attractive, which may mean continued imports of Australian coal. While India gets most its coal from Asia, India is Australia’s largest coal export partner (from 2012-13 figures). Coal currently makes up 60 per cent of India’s generation capacity with capacity increasing from 62 gigawatts in 2002 to just over 145 gigawatts today. Even with these increases India still has a significant energy and peak demand deficit that needs to be addressed. With rising coal prices, energy security remains an issue. As in Australia, India has discovered additional gas reserves in a number of river basins and this will provide an opportunity to move to more generation. This will help with carbon emission reduction, and provide a reliable energy source. 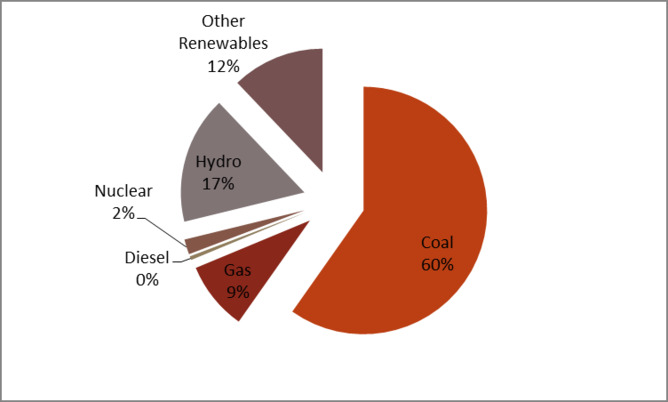 By 2025 we anticipate that India’s electricity generation from coal with reduce from current levels to only 50 per cent of installed generation — but that doesn’t necessarily mean less coal generation. While we don’t know exactly which coal developments in Australia are marked for India (such information is considered “Commerical-in-confidence”, at least one major Indian port operator is linked to coal port expansion in Queensland, indicating that they are looking at growth. In the end it will likely be prices that dictate how much Australian coal goes to India, rather than India’s energy policies. Craig Froome is Global Change Institute – Clean Energy Program Manager at University of Queensland. This post originally appeared in The Conversation.